Aaron Haire is his way to Craigavon Area Hospital for treatment after Saturday's collision. Pic by PressEye Ltd.
Carrick Rangers manager Kieran Harding took time out of his post-match analysis to send out hopes for a speedy recovery to Aaron Haire. 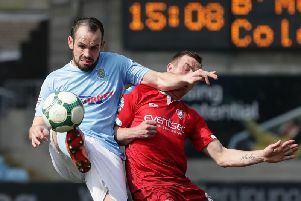 Haire is a player familiar to Harding during seasons spent on the Shamrock Park books under the current Carrick boss in his past role as Portadown assistant manager. The young striker was in need of over 10 minutes of on-field treatment after an accidental collision with Carrick goalkeeper Ryan Morell as Haire scored Portadown’s third goal. Despite the disappointment of the 4-0 defeat for Harding, he was keen to pass on his concern. “Aaron is a player I know from our time at Portadown of course,” said Harding. “He caught Ryan’s knee during the third goal. “My hope is that he can make a full recovery as quickly as possible. Play was delayed as medical staff provided Haire with extensive treatment on his jaw and shoulder. He was sent by St John ambulance to Craigavon Area Hospital for further treatment. The forward spent Saturday night in hospital and is expected to be out for around six weeks with a fractured jaw.